Acrylic Binder Medium. 1Lt.A waterbased acrylic emulsion, which can be used straight from the bottle or thinned with water 1:1 to seal most surfaces. Atelier Binder Medium can be used as a sizing on canvas or cotton duck to seal the surface and prevent absorption of paint into the fabric. Mix wit..
Acrylic Binder Medium. 250ml.A waterbased acrylic emulsion, which can be used straight from the bottle or thinned with water 1:1 to seal most surfaces. Atelier Binder Medium can be used as a sizing on canvas or cotton duck to seal the surface and prevent absorption of paint into the fabric. Mix w..
Atelier Clear Painting Medium - painting graduations - 250mlA mid viscosity medium that allows paint to be diluted smoothly for glazing and blending techniques without altering sheen level. 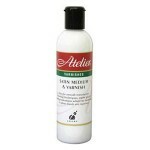 It has a high water content and will allow Atelier Interactive to remain workable for longer without ..
Atelier Fast Medium / Fixer - 250ml.A low viscosity medium used for thin fast drying layering techniques. It can also be used on its own to seal and reinforce a paint layer in preparation for scratch back, glazing or varnishing. ..
Impasto Gel Medium. 250ml.An acrylic gel with a smooth buttery consistency. Use as a paint extender to adjust gloss and transparency without altering consistency. Mix with paint to increase body or apply directly on top of paint layer for a transparent textural effect. Holds moderate peaks and te..
Impasto Gel Medium. 4Lt.An acrylic gel with a smooth buttery consistency. Use as a paint extender to adjust gloss and transparency without altering consistency. Mix with paint to increase body or apply directly on top of paint layer for a transparent textural effect. Holds moderate peaks and text..
Impasto Gel Medium. 500ml.A thick, fast drying, waterbased acrylic gel, designed to exaggerate structure and sharpen textural edges of the paint. It can be used as a very strong adhesive for bonding heavy objects. Can be mixed with the paint, overpainted once dry, or applied on top of a paint lay..
Atelier Liquefying Medium (formerly Flow Control) - 250ml.Is a low viscosity acrylic extender. For fine detail, stir into paint creating a 50/50 mixture or until desired viscosity is reached. For airbrush techniques, mix in small amounts and stir until an ink-like consistency is reached which sui..
Modelling Compound - Building texture. 250ml. 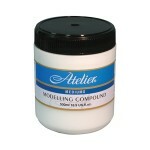 ..
Modelling Compound - Building texture - 500ml. ..
Modelling Compound - Building texture - 4Lt. ..
Retarder. 250ml.A paint additive designed to slow down the drying time of acrylic paint. It may be added to other Atelier mediums to increase open time. Note: Retarder does not contain a binding agent so to avoid creating an unstable mixture, it is recommended to mix no more than 10% with acrylic.. Slow Medium. 250ml.Extends wet-in-wet blending time and is designed to be used in conjunction with a water sprayer. It will tack up quite quickly but is very easily made workable again with the water sprayer. It is preferable to use a water sprayer to extend blending time, rather than adding more..
Unlocking Formula - 250mlAllows artists to re-open Atelier Interactive even after it is touch-dry. Once the paint is re-opened, new paint can be blended back in, existing paint edges can be feathered or whole sections can be removed with a rag to reveal under layers. Spray apply using the Atelier..
Water based Gloss Medium Varnish - 250mlLow viscosity products made from hard acrylic emulsion. Can be used as an over-varnish for Atelier Interactive and other traditional acrylic paints. To use as a varnish over an Interactive painting seal with 2 coats of Fast Medium/Fixer before varnishing. T..
Water based Matte Medium Varnish. 250ml.Low viscosity products made from hard acrylic emulsion. Can be used as an over-varnish for Atelier Interactive and other traditional acrylic paints. To use as a varnish over an Interactive painting seal with 2 coats of Fast Medium/Fixer before varnishing. T..
Water based Satin Medium Varnish - 250ml.Low viscosity products made from hard acrylic emulsion. 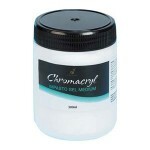 Can be used as an over-varnish for Atelier Interactive and other traditional acrylic paints. To use as a varnish over an Interactive painting seal with 2 coats of Fast Medium/Fixer before varnishing. 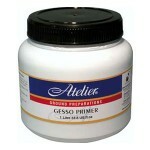 ..
Atelier Gesso Primer - 500ml.A flexible acrylic ground with a high grit content designed to provide a stable white surface on which to paint. Atelier Gesso may be used directly from the container for all over thick textural effects. ..
Atelier Gesso Primer - 1Lt.A flexible acrylic ground with a high grit content designed to provide a stable white surface on which to paint. Atelier Gesso may be used directly from the container for all over thick textural effects. ..
Atelier Gesso Primer - 4Lt.A flexible acrylic ground with a high grit content designed to provide a stable white surface on which to paint. Atelier Gesso may be used directly from the container for all over thick textural effects. ..